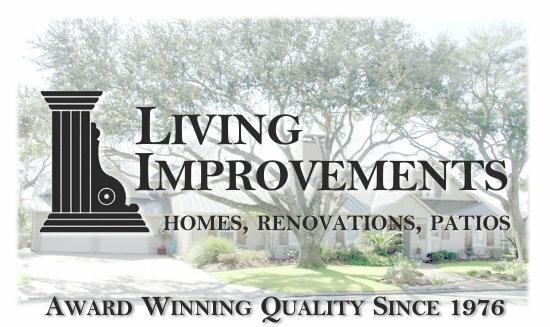 Living Improvements has been improving and upgrading homes in the Greater Sugar Land and South West Houston areas since 1976. Honesty, integrity, quality, and attention to detail are the principles that drive our day to day operations. As a result, Living Improvements has impeccable ratings among clientele, suppliers and subcontractors. The reputation of Living Improvements is so outstanding that nearly 100% of its business comes directly from referrals. The business owners, superintendents, office staff, and craftsmen are committed to designing and constructing spaces and environments that meet and exceed the highest expectations of our clients. Our in house field crew is exceptionally intelligent, skilled, professional, and detail oriented. Our overall staff’s combined experience surpasses 150 years. We only utilize top quality, skilled, professional subcontractors that are honest and trustworthy. Our skilled and knowledgeable in-house crews only use proven top quality materials in our construction. Precise scheduling – We begin each project when we say we will begin, and we remain committed to each project until it is completed to the client’s satisfaction. Respect for property – The project site is always left clean from start to finish. More than 40 years of professional experience in meeting the satisfaction of the building and remodeling needs of clients in Fort Bend, Harris, and surrounding counties. We uphold the high ethical standards of business practices set forth by the National Association of Home Builders Remodelers Council.